One out of 10 babies is born prematurely in the United States. These babies typically are cared for in neonatal intensive care units, often called NICUs. Traditional NICUs have an open-bay design where multiple babies are cared for in a large room. More recently, single-family room NICUs have emerged and have led to a variety of positive medical, developmental and behavioral outcomes. However, one study demonstrated an unexpected outcome: Babies cared for in these settings had MRI scans showing decreased brain development and lower language scores at two years of age. This finding highlighted the importance of adult language to the development of vocalizations in preterm babies. Accordingly, we and two colleagues – Dr. Betsy Diamant-Cohen of Mother Goose on the Loose and Summer Rosswog of Port Discovery Children's Museum – partnered together to develop, implement and evaluate a literacy program called Mother Goose on the Loose Goslings. Goslings is a one-hour interactive early language and literacy program for families with babies in the NICU. It is a revision of Mother Goose on the Loose, a nationally recognized early literacy program for parents and caregivers with children from birth to age 3. Our team revised it to be appropriate for medically fragile newborns in the NICU. 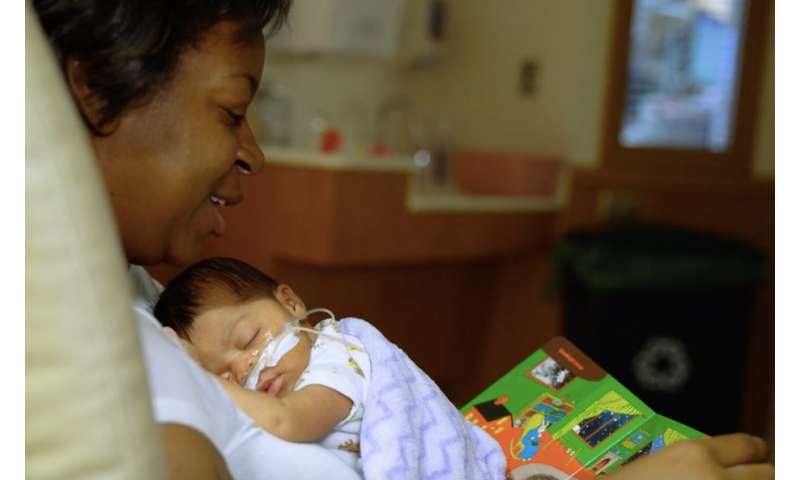 Families in the NICU at University of Maryland Children's Hospital are participating in this new program designed to help foster their premature baby's language development, and we are studying the results. What's good for the mother is good for the Goslings? As with the original Mother Goose on the Loose program, the Goslings program teaches parents the importance of stimulating their baby's language development through talking, reading, singing songs and reciting nursery rhymes. To best meet the needs of these medically fragile babies, Dr. Betsy Diamant-Cohen modified traditional songs and nursery rhymes in two ways: They were revised to address medical needs and concerns of small babies, and they were adapted to enhance parent-baby bonding by using the word "love." For instance, instead of singing "If you're happy and you know it, clap your hands," parents are encouraged to sing, "Since I love you very much, I'll hold your hand." A novel aspect of Goslings focuses on teaching parents when it is best to provide this additional stimulation. A traffic light concept is used to teach parents about providing stimulation according to their baby's medical status. Red light: The baby is very medically fragile; interactions should be limited to a quiet voice. Yellow light: The baby is medically ready for a little more stimulation; parents can add touch and holding to their voice. Green light: The baby is medically ready for all of the items in the Goslings kit, which includes finger puppets, rattles, colored scarves and books. In addition, parents are taught how "to read" their baby's signals to know when they are behaviorally ready for these interactions and when they are too overstimulated. A baby who is "happy and ready" for interaction will appear relaxed, look at faces or objects, coo and/or smile. A baby who is "not happy and ready" may look away, frown, grimace, splay their fingers apart and/or cry. Port Discovery Children's Museum staff has provided Goslings at the UMCH NICU for two years. We collaborated to evaluate the effectiveness of the Goslings program. During the first year, the primary questions were whether family members who participated thought the program increased their knowledge of how to interact with their babies. Sixty-six parents and other relatives participated in the evaluation by completing pre- and post-intervention questionnaires about their views of the program. All 66 parents said they would recommend Goslings to other parents of babies in a NICU and would recommend that the program be implemented again at the UMCH NICU. Parents thought the program had increased their knowledge of how and when to interact with their babies to stimulate their language development. Almost all the parents also thought they would significantly talk, sing and read more with their babies after completing the intervention. One significant limitation of these data, however, is that we could not assess whether interactions between parents and their babies increased after the Goslings program. The evaluation in the second year sought to determine whether parents implemented what they learned from the Goslings program. A new sample of 38 parents and other relatives completed pre- and post-program questionnaires about their views of the program. Ten of these parents also participated in more in-depth interviews one to two weeks after attending Goslings. The findings were consistent with those during the first year. In addition, parents who participated in the in-depth interviews, reported that they implemented what they learned, particularly in terms of talking and singing with their babies. Some even read and recited nursery rhymes. All parents discussed how the program improved their abilities to understand their babies' signals of readiness. Those parents who were not reading had babies who were not yet medically or developmentally ready for such interactions; however, these parents reported that they intended to read with their babies once it was more appropriate. The positive impact of Goslings on parents was further validated by the results of an anonymous survey completed by 37 nurses in the same NICU. Most nurses, 84 percent, reported they observed changes in parents' behavior. They said parents seemed more aware of their babies' needs, more understanding of their signals, and more knowledgeable and confident about how to interact appropriately with their babies. Nurses observed these parents reading, singing, and using program materials with their babies. These results suggest that Goslings may be an important program for fostering language experiences of babies in NICUs. The next step to evaluate the effectiveness of Goslings is to extend the interview process to families who have been home for several months to see if program concepts are still being applied.